...was not only in possession of a rather wonderful name, but was also an extremely generous man who believed in encouraging young poets so much that he set up a Trust, in his name, for the annual support and recognition of their work. I am very grateful to him for this rare gift - not just because his Trust has awarded money to some of my favourite poets since 1969, but that it has also - marvellously, inexplicably, startlingly - awarded some to me. My heartfelt thanks also go to The Society of Authors and this year's judges, Moniza Alvi, Polly Clark, John Greening, Sophie Hannah, Adam O'Riordan and Carol Rumens. And my warmest congratulations to my fellow winners: Joey Connelly, Holly Corfield Carr, Caleb Klaces, Rachael Nicholas, Phoebe Power and Jon Stone. The other winners will be reading tonight, in London, at the Betsey Trotwood, though unfortunately I can't make it (it's Shake the Dust tomorrow so I had to be back in time!) We'll all be reading at the Ledbury Poetry Festival, so do come and see us if you get the chance. It still hasn't quite sunk in, but it's getting there. 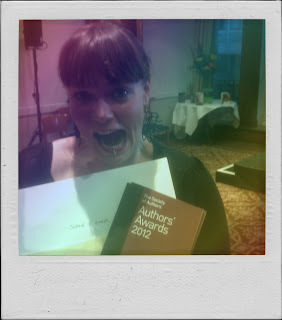 Here's me with the certificate and a rainbow muppet face gurn on.